In Victorian prisons in the 1800s, the most common form of punishment was the lash. Prisoners received 25 lashes for minor infringements and 50 for more serious crimes. They were tied to a three-beamed triangle – known as being ‘married to the three sisters' – and dealt the blows. Lashings would often strip the flesh from a man's back, and many became seriously ill or died as a result. One ‘innovative' form of punishment was the treadmill: a long, cylindrical wheel on which a row of prisoners were mounted and secured to a handrail. By pedalling the wheel – like a mouse playing in its cage – the men ground up large blocks of bluestone into gravel. The men would form blisters on their hands and injure their feet and legs as they kept pedalling. Not surprisingly, some prisoners refused, accepting time in solitary confinement instead. The walls would be so thick that no sound could penetrate. The light would be from above so there would be no looking out of the window. The door would be solid, of wood, and very thick, and closing so that no sound could come through them; each man would have his bell which he would ring if he was taken ill, or wanted the warder...there would be an inspection aperture, closed with plate glass. This type of psychological punishment extended to every aspect of the prisoners' daily life. 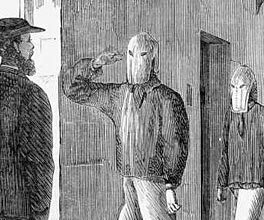 In the exercise yards, they wore masks so that they couldn't recognise each other. When talking to the warden, they used their prison number, not their names. Champ continued to use the Panopticon, even when the crime rates for the colony had dropped. But by the turn of the century, its use had declined and, although it still stands today, it forms part of the redevelopment of the Pentridge buildings into modern housing.